SigmaSMS company proposes solutions for mailing integration of short messages from your software with a help of our SMS gateways. SMS messaging at API provides fast and easy mailing for your clients, from CRM or software. I agree with the terms of the data processing agreement. API is application programming interface. CRM, ERP systems, CMS for site management and other software products are used as software tool. Mailing module is easily integrated into any software with a help of using HTTP, XML and SMPP. There are integration modules for the popular CRM system users, such as Bitrix24, YCLIENTS, amoCRM, InSales, vTiger.The list of modules is growing to cover the maximum number of popular solutions and simplify API integration of SMS messaging for clients and employees. The system integrates messaging with the following channels:SMS, Viber, VKontakte, Odnoklassniki. It is also possible to use proprietary technology cascade mailing Smart Route. Carry out mass mailing. Inform your clients about offers and special promotions, account balance or accumulated points. Send service messages about the delivery of the order or the arrival of a taxi. Easy, fast and at the specified time. Use cascade mailing. Save up to 70% of your mailing budget. The system analyzes the contact base and mails at the most profitable channel. 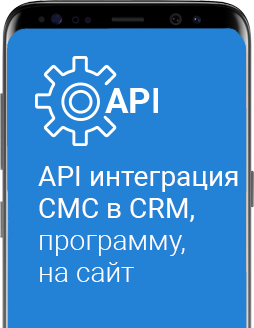 API supports four channels: SMS, Viber, VKontakte, Odnoklassniki. Plan and automate mailing. API integration allows automating of mailing. You can make uniform or delayed mailing, set up automatic congratulating of clients on holiday or birthday. Set up two-factor authorization. Because of the API integration you can set up authorization by one-time SMS password on your Internet service. SMS confirmation of user’s actions when filling out the forms on the site is also can be configured. Quickly integrate into popular CRM. SigmaSMS company prepared mailing modules for popular business management systems. The number of modules is constantly growing to cover the business needs for reliable and profitable mailing. Заполните форму. Менеджер компании свяжется с вами, расскажет о протоколах интеграции и готовых модулях. is used n web development, the protocol is a system consisting of requests/responses directed to the client server. Requires the use of special software and a permanent connection to the gateway. Universal method of transmission of digital information. For more information you can contact our manager in any way convenient for you. We suggest you to read additional materials in the relevant part of the site.